The Champions Universe, being inspired by the major mainstream comics companies, embraces the full range of classic super character origins you see in those comics: mutagenic accidents, genetic mutation, radical scientific inventions, mystic martial arts, aliens, spellcasting sorcery, gods and supernatural creatures, cosmic entities, etc. However, there are a number of origin concepts, described in the Champions Pen and Paper books, that IMHO are pretty original and distinctive to the setting, but don't require characters with unusual backgrounds. I thought it might be helpful to the community if I outlined a few of my favorite unique origins here, which someone might find useful for their own Player Characters. Coruscations of Power: In the worldwide accidental cataclysm which devastated the alien planet Ashraal centuries ago, and gave birth to the awesome cosmic villain Xarriel, discreet bursts of energy from the main explosion were cast across space and time, emerging in random locations in the space-time continuum. To date at least five of these "coruscations of power" have appeared on or near the Earth in recent years, and affected humans in their vicinity, creating the supervillains Photon, Stareye, Sunspot, and Vector, and the superhero Victory. The coruscations can manifest as bursts of light from space, but in the past have been mistaken for solar flares or lightning storms. Powers induced by them can, but not necessarily must, include various forms of energy projection, flight (usually very fast), mind-affecting abilities, enhanced physical strength, speed, and durability, and the ability to survive in hostile environments (even space). Xarriel is fully detailed in Champions Beyond, while the other villains mentioned are in the Champions Villains trilogy, and Victory in Champions Universe. Department 17: Since World War II, the United States government has researched ways to safely and reliably create superhumans, as well as to more effectively control them, with few successes. Their efforts have often resulted in severe, even fatal physical and mental side effects to their subjects, and produced as many supervillains as superheroes. During WW II the US military set up the Haynesville Project for this purpose, at Fort McLaughlin (now McLaughlin Air Force Base) near the small town of Haynesville, Kansas. After the war the Project was declassified and officially shut down, and McLaughlin AFB appears nearly abandoned today. This was a ruse. The Haynesville Project was never shut down. Still secretly based at McLaughlin, what is now titled Department 17 is the Defense Department's hub for research into superpower generation and superhuman control. Under its current director, General Clarence Smith, it conducts a wide variety of research involving drugs and chemicals, radiation treatments, genetic engineering, and other exotic methods. Much of the Department's current research focuses on refining the Cyberline procedure used for PRIMUS's Avenger program. The Department's scientists are also very interested in investigating any reports of new manifestations of superpowers. General Smith might go to great lengths to keep 17's existence and activities secret. He's also used some "creative" accounting to keep his department funded. Department 17 is described on Champions Universe p. 138. "Divine" Intervention: In the Champions Universe, all the gods and demons of myth and religion that humans still remember actually exist. Although very powerful in their home astral dimensions, a metaphysical barrier called the Ban prevents them from manifesting on Earth with their full power. But there are a few ways divine beings can create lesser-powered Earthly agents to champion their causes. One of these ways is to infuse some of their power, and sometimes personality, into a deserving human host, creating a superhuman reflecting the qualities of his or her patron deity. Quite a few official Champions heroes and villains have been empowered in this way. In keeping with comic-book origin conventions, their empowerment typically comes under unusual and dramatic circumstances, often at a key turning point in the life of the hero. For example, the first Johnny Hercules was given an amulet by an "apparition" of Zeus when the circus he worked for toured Greece, containing the "Hercules Force," the power of Hercules as a demigod which he abandoned when he became fully a god. The Nigerian hero Ogun gained power over metal after being beaten near to death by criminal thugs, when he received a vision of the Yoruba god of the forge of the same name. Ogun is thoroughly detailed in Champions Worldwide, while the current Johnny Hercules is featured in the PDF book The Hercules Force, available from the Hero Games website store. Much more on CU gods and the Ban can be found in The Mystic World. Empyrean Heritage: For hundreds of thousands of years, the immortal superhuman offshoot of humanity called Empyreans have existed alongside their human cousins. While they maintain their own city of Arcadia in Antarctica, hidden from human discovery by advanced devices, the majority of Empyreans choose to live incognito among humanity. The general population is ignorant of their existence; only a few superheroes have been trusted with the secret, although the Lemurians know of Arcadia and have been enemies of the Empyreans for many millennia. A few Empyreans have acted as superheroes or villains in the modern era. Empyreans sometimes have children by humans, who are always either normal humans or full Empyreans. These children may grow up unaware of their true heritage; but the Empyreans' leaders scan the world for any new Empyrean offspring, and when they discover one induct him or her into their society. But individual Empyreans can follow whatever activities they like, provided they don't reveal their race's existence to mankind. All Empyreans are ageless, physically superhuman to a greater or lesser extent, and can fly. They can manifest a wide range of mental or energy powers, although the type and degree varies based on innate ability and the interest a given Empyrean has in developing specific powers, usually related to their preferred pastimes. The Empyreans and Arcadia are extensively described in Hidden Lands. Hzeel Biomatter: Champions Earth has experienced several alien invasions in the past, and of course is currently dealing with renewed intrusions by the Gadroon and Qularr. What no one on Earth knows yet, is that another aggressive species, the Hzeel, also have the Earth in their sights. These short, blue-skinned humanoids have scouted Earth for nearly two decades, wanting it as an advance staging area in their war against the Dorvalans (Ironclad's race). At least two Hzeel scout craft have crashed on Earth and been discovered by humans. One of these was salvaged by Roger Warwell, aka the Warlord, and its technology became the basis for his own weapon designs. Hzeel technology is partly biological, and can have radical unpredictable effects when it comes in contact with human tissue. Two humans, the solo supervillain Howler, and the Warlord's minion Warcry, gained superhuman vocal powers when Hzeel communications devices were implanted in their throats (this happening spontaneously on contact in the case of Howler). The effect also extends to tissues from Hzeel themselves; VIPER's staff supervillain Oculon gained his powerful eyebeams from eyes from an Hzeel corpse transplanted to his sockets. (Hzeel don't have eyebeams, they're the result of interaction between the two species' biologies.) Anyone using recognizable Hzeel materials would undoubtedly be of interest to both the Hzeel and the Warlord. The Hzeel have a whole chapter in Champions Beyond. The other villains mentioned are in the Champions Villains trilogy, except Oculon who's written up in VIPER: Coils Of The Serpent. Kelvarite: This mysterious, green-glowing extraterrestrial mineral has been found in meteorites from several falls. It's a powerful source of energy, but is extremely unstable and prone to explosion when disturbed. Some people who have been bombarded by radiation or fragments from exploding kelvarite have gained superhuman powers, typically (but not exclusively) superhuman strength and durability, and some type of enhanced movement capability, e.g. super-running or -leaping, flight, or teleportation. They also acquire a susceptibility to radiation from other samples of kelvarite. Known superhumans with this origin include the solo villains Tachyon and Thunderbolt II, Dr. Destroyer's servant Meteor (all in the CV trilogy), and the African superhero Gazelle (in Champions Worldwide). Large organizations such as the US government and UNTIL have secured all the kelvarite they can find, but sometimes lend samples to research laboratories. Other kelvarite meteorites remain to be discovered. However, what no one is aware of is that what they call kelvarite is actually impure samples, which is why it's unstable. Pure kelvarite doesn't resemble the impure mineral, and is extremely rare on Earth. Its energies respond to the will of intelligent beings in physical contact with it, allowing them to wield formidable energy-projection powers. (It isn't obvious that the power comes from the kelvarite itself.) The only pure kelvarite discovered so far was made into rings worn by the three men who have used the superheroic identity, Meteor Man. Martial-Arts Temples: For centuries, hidden enclaves have existed in the Far East where dedicated monks have practiced the most advanced physical and spiritual martial-arts techniques, including virtually superhuman abilities for those with the skill and determination to master them. The most legendary of these sites among knowledgeable martial artists are Yengtao Temple, somewhere in the mountains of China; and the city of Shamballah, in a cave beneath a mountain in the Himalayas. Both sites are hidden from the outside world both physically and magically, so that only those already highly disciplined in body and mind can find them. But those who do can study almost any martial art that has ever existed, and perhaps achieve abilities like the heroes of legend. Various students at Yengtao Temple have returned to the outside world to become heroes, or villains. In the present day the Millennium City superhero Nightwind, his bitter rival Jade Phoenix, and the Hong Kong hero Golden Dragon Fist, all learned their extraordinary skills and ch'i powers from Yengtao. Jade Phoenix was responsible for the destruction of Yengtao Temple and murder of the monks in 1996, but there may be other former students alive in the world. And Shamballah, second only to Yengtao as a repository of mystic martial-arts secrets, still stands. But Shamballah also guards a dark secret even further beneath the mountain: its evil twin city, Agharti, prison of the Dark Monks, also extraordinarily skilled but utterly corrupt. While the Shamballans prevent the Dark Monks from escaping, they don't forbid outsiders from visiting the city, or leaving afterwards. The story of Yengtao Temple, and description of some of its unique techniques, appear in Champions Universe. Shamballah and Agharti are described in considerable detail in Hidden Lands. Project Sunburst: In 1994 a group of American "rogue generals" assigned 200 volunteer soldiers to what they were told was a "war game." In fact the generals were experimenting to try to create superpowered soldiers resistant to radiation, by detonating a nuclear device near them while they wore protective suits. Most of the volunteers soon died of radiation poisoning, while a handful slipped into comas. They were placed into a secret holding facility, codenamed "The Crypt." In the intervening years, several of these survivors have developed superhuman physical and energy powers. A few, such as the master villain Sunburst and his follower Radium, awakened spontaneously. Others, such as Dr. Destroyer's security chief, Gigaton, were aroused with help from other villains. Some escaped the Crypt on their own, while others were "liberated." All the active survivors except Gigaton and the powered-armor villain, Armadillo, have joined Sunburst. However, the remaining comatose subjects are still being kept in secret in the Crypt. All of these villains are fully written up in the Champions Villains trilogy. The Swords of Nama: During the Dark Ages the serpent-god Nama, who is today the patron deity of VIPER, set out to become a great power among Men. He gathered six mighty warriors from across Eurasia to be his agents and generals, to conquer an empire in his name. For each warrior he forged a powerful enchanted sword. But before they could achieve any major successes the warriors quarreled, which ultimately led to all their deaths. The Swords of Nama were scattered. Over the intervening centuries some of these legendary swords reappeared, and a few were destroyed; but others remain to be discovered in ruins across Eastern Europe. The story of the six "vipers upon the land" appears as a small part of the history of Nama and VIPER, on p. 6 of the book, VIPER: Coils Of The Serpent. Aside from being called "serpent-blades" the Swords of Nama aren't described, nor are any of their qualities defined, which leaves someone free to imbue a particular sword with any powers desired. Note that Nama is neither good nor evil, and has helped heroes or villains as the mood struck him; so there's no inherent reason for his Swords to be one or the other. 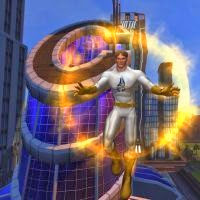 Teleios, the Perfect Man: Many people who have only encountered Teleios during play in Champions Online may think of him just as a cloner of people, and a creator of animalistic monsters. While he certainly does such things, the range of his genetic expertise goes far beyond that. More than half a dozen official supers, villainous and heroic, owe their powers or very existence to The Perfect Man. Teleios has the skill to induce almost any super power in any human, whether or not that person already has powers or the potential for them. Teleios will do this for pay, or in exchange for services or favors, as he did for the supervillain-turned-hero Flashover (Champions Universe: News Of The World), and her brother, the villain Hurricane (Champions Villains Vol. 3: Solo Villains). Teleios has been known to bestow powers on someone on a whim, whether or not they want them, like after a dalliance with the Indian woman now known as Monsoon (Champions Worldwide). The Perfect Man can grow completely original, humanoid or human-looking superhumans with any abilities he chooses. He sometimes sells his creations, as when he supplied VIPER with the powerful monster named Obelisque (Champions Worldwide). Sometimes Teleios turns a creation loose in the world uncontrolled (although not unmonitored), to see how it responds and develops. He did this with the beings labeled the Landsman, and the Lodge (both in Champions Of The North). The master geneticist can program his creations with whatever skills he or his employer desires. He can even implant elaborate false memories, to the point where the person has no idea he or she is artificial or has any connection to the Perfect Man. This is how Teleios programs the cloned soldiers he sells to other villains and groups. The superheroine called the Teen Dream (Teen Champions), whom Teleios designed as an experiment in social manipulation, is unaware of her real origin and considers herself a true hero. When he makes a creature Teleios implants controlling genes that make it psychologically impossible for that creature to harm him, or may even make it a loyal follower. Those controls can be so subtle that a person isn't consciously aware of them. Although the lore doesn't specify it, it would be reasonable to assume Teleios does this to humans he augments. Teleios, the Perfect Man, is fully written up in Champions Villains Vol. 1: Master Villains. Vandaleur Bloodline: Founded a thousand years ago by their immortal progenitor, Adrian Vandaleur, this widespread clan of sorcerers is one of the premier occult dynasties in the Western world. Although the majority of Vandaleurs have no more talent for magic than most people, the gift for spell casting is far more common among them than in the general populace; and their ranks include some of the most powerful mages in the world. Members of the family are aware of each other, and sometimes cooperate, sometimes conflict. But Adrian Vandaleur, whose power dwarfs that of his kin, keeps any factionalism from descending into violence. Otherwise individual Vandaleurs are free to follow whatever activities they like. Their personalities and morality vary widely. Some are benevolent, even heroic; others are amoral and ruthless, up to megalomaniacal psychopaths. Most are simply concerned with their own interests. Any Vandaleur with magical ability and desire to develop it could find family members able and willing to train him. The Vandaleur family are described in detail in Champions Villains Vol. 2: Villain Teams. The Zodiac Working: In 1979 the late master villain Archimago, greatest sorceror of the Twentieth Century, attempted this great ritual, to impregnate twelve women by twelve powerful demons. The resulting hybrid children could be used by the demons as hosts to incarnate themselves on Earth with all their power. The ritual was interrupted and the women rescued by the superhero team, the Fabulous Five. The women seemed unharmed and weren't pregnant, so returned home. Two years later one of these women married and gave birth to a girl who later manifested powers of destructive energy, as well as a propensity for rage and vandalism. She grew up to become the supervillain Frag (fully written up in CV Vol. 3). She has no knowledge of her true origins, thinking herself a mutant. Although she usually appears human, when enraged her form becomes more demonic-looking. Another of these women gave birth to a son, who now acts as the superhero Pagan (described in the book The Ultimate Mystic). In his superhero identity (resembling a satyr) he's physically superhuman and can project powerful mystic light. Pagan discovered his true heritage when his demonic father Belial attempted to seduce him to his service. Although his demonic inclinations are strong, Pagan's inherent decency has so far won out. To date nothing has been revealed about the other ten victims of the Zodiac Working. Thank you. It's always more fun to tie a character's origin in with the existing IP. In a similar vein, my own character, the young "mutant" Ankh may one day discover his true origin as an intended Avatar for a Major Demon Lord. Much like Frag, he also gains greater demonic features when he really lets loose with his power, although he doesn't have any rage issues really. If anything, he's pretty rational and logical, and has a deep-seated decency strangely rooted in his rebellion to the abusive single-parent white-trash upbringing he endured, followed by two years of homelessness after he ran away from home. In the Champions Universe, not every star is created out of condensation of nebular gas. On rare occasions the universe gives birth to a starling, a being who resembles one of the sapient species inhabiting it, but who will eventually metamorphose into a star. (This "starling theory" is known only to the Mandaarians, and many of them don't actually accept it.) A starling looks like an organic being, but is physically superhuman and wields formidable stellar energy powers, which grow as the starling matures. The type of life a starling leads affects what kind of worlds and lifeforms will arise from it after it becomes a star. A starling raised in a gentle, loving environment would nurture life and promote peace, while one who suffered pain might give rise to hostile worlds and warlike species. One starling appeared on Earth some years ago, in the form of an adolescent girl, with no knowledge of her past. Dubbed Gloriana, she studied briefly at Ravenswood Academy (the setting's school for superhuman youth) before an accident drove her insane. She's caused considerable random trouble since then, but her current whereabouts are unknown. Gloriana is written up in Teen Champions. I take it that's the Gloriana of "Blessing of Gloriana". Damn, I miss the old items. Grind for the Grind God! Tokens for the Token Throne! Yup. They're more or less who and what you think they are. But their story does tie in to the theme of this thread. The origin of the Fabulous Five involved launching their prototype spacecraft to intercept a comet threatening to collide with Earth, only to discover the comet was actually a ship of the alien Kuzane, who were planning the conquest of Earth. The Five destroyed the Kuzane ship, and the energy from its explosion mutated them into superhumans. But that blast also hurled at least one artifact of Kuzane technology to Earth -- not just through space, but through time as well. It landed in the Himalayas centuries before the Kuzane arrival, where a group of monks found it and guarded it as a sacred item: the Bell of the Chosen. It was this Bell that changed Jeffrey Sinclair into the world's mightiest superhero, Vanguard. To anyone's knowledge, no other Kuzane artifact has been found. But given the circumstances, another one might turn up anywhere on Earth, and anywhen. Talk about your epoch artifacts. I was recently reminded of another potential CU character origin of general utility, which I've also added to the list on the first post on this thread. I've also added to the main list on the first post, an entry for Department 17, the United States Defense Department's project to create, and control, superhumans. I love these threads and origins. I may have a heroine hailing from Project Sunburst (Still deciding on her back story, etc). Coruscation of power explains "Aguila Sideral" energy manipulation and durability. Another char is the result of a very old (12th century) demonic pact by someone of her family. The Zodiac Working may explain why after so many years these far more powerful demonic powers are manifesting in her and not on the other members of her lineage. It is great that you are posting these ideas here. Keep the good work. Since you mention Atlantis, it's worth noting that there are "barbarians" of the Atlantean race beyond the city-state itself. Over a dozen tribes are scattered across the Atlantic Ocean, with those close to Atlantis maintaining diplomatic relations with it. Smaller groups have settled in the Pacific and Indian Oceans, and one band of hunters roves under the North Polar ice cap. No superhero setting this side of Marvel or DC has as much breadth or depth as the Champions Universe. What we've seen in Champions Online only scratches the surface. The tabletop game setting has evolved over more than thirty years, and the current official universe is detailed in literally dozens of books. This looks really useful for players who love creating detailed bios for their heroes. Especially if your going to be adding to it from time to time. Maybe somebody should ask Mr. Smackwell to sticky it. I'm glad you feel that way, Zed. I was hoping people would find the thread useful. I would of course accept an official decision as to whether or not it should be Stickied. That said, I'm not sure how much more I would add to that list. As I wrote in my first post, the CU embraces the full range of classic comic-book origins; but the ones I listed are more distinctive to the setting, while also being broadly applicable to a range of heroic or villainous types. At this moment I can't think of others from the setting that fulfill both criteria -- they're either very typical for the genre, very specific to a certain character type or background, or come with a lot of strings attached. For things like that I find it more fruitful to offer suggestions on a case-by-case basis. Like when I happened to know a piece of lore that I thought our colleague Stjobe might like for his character, Wrathchild. Still, I wouldn't be surprised if one or two other appropriate ones come to mind. I'll give notice if they do. After a lot of deliberation, I've decided I should include the following entry (which has also been added to the list in my first post), because the precedents say his potential use is much broader than most people think. Teleios has the skill to induce almost any super power in any human, whether or not that person already has powers or the potential for them. Teleios will do this for pay, or in exchange for services or favors, as he did for the supervillain-turned-hero Flashover (Champions Universe: News Of The World), and her brother, the villain Hurricane (Champions Villains Vol. 3: Solo Villains). Teleios has been known to bestow powers on someone on a whim, whether or not they want them, as he did after a dalliance with the Indian woman now known as Monsoon (Champions Worldwide). The Perfect Man can grow completely original, humanoid or human-looking superhumans with whatever abilities he desires. He's been known to also do this for pay, as when he supplied VIPER with the powerful monster named Obelisque (Champions Worldwide). Sometimes Teleios turns a creation loose in the world uncontrolled (although not unmonitored), to see how it responds and develops. He did so with the beings labeled the Landsman, and the Lodge (both in Champions Of The North). The master geneticist can program his creations with whatever skills he or his employer desires. He can even implant elaborate false memories, to the point where the person has no idea he or she is artificial or has any connection to the Perfect Man. Teleios does this with the cloned soldiers he sells to other villains and groups. The superheroine called the Teen Dream (Teen Champions), whom Teleios designed as an experiment in social manipulation, is unaware of her real origin and considers herself a true hero. When he makes a creature Teleios implants controlling genes that make it psychologically impossible for that creature to harm him, or may even make it a loyal follower. Those controls can be so subtle that a person isn't consciously aware of them. Although the lore doesn't specify it, it would be reasonable to assume Teleios does this to humans he augments. I'm sure Professor Paradigm is working on figuring that out. And thank you for your compliment. They are not really furries, galaxy eating gods, etc. They are all individuals affected by a PSI plot to release certain psychoreactive chemicals into the population in an attempt to produce a surge in the psionic metahuman population. Gargath the Terrible may think that he is a galaxy eating god, but in reality he is just George Sellers, accountant under the influence of PSI's chemical agent, "Q." As to the preference for Red/Black ? Unfortunate fashion side effect of the drug. Pity them for they know not what they do. 'Caine, miss you bud. Fly high. So basically they are all drug addled wannabees? That actually makes a lot of sense. Glad you found it thought-provoking, Bluegrassbeast. I hoped this thread would be helpful. But all I can do is post 'em -- I can't make people read 'em. The official Champions Universe is jam-packed with "bits" of cool lore like that, distinctive to this setting; but the majority of them, like this one, involve rare phenomena, a very specific history, and/or come with significant strings attached. The ones I listed in my initial post have broad applicability and don't require an exotic background. Not every PC can be one of the incarnated elemental gods who fled the dimension of Thulkos to escape being absorbed by Tyrannon the Conqueror; but any human can stumble across a crashed Hzeel scout ship and touch the wrong piece of bio-tech. A discussion on another forum persuaded me to add another category to this thread, and to my first post at the top of it, for an origin that's relatively common in the Champions Universe, but which many players may not think to explore. I have to thank you for the information on Empyreans. That makes my life considerably easier, since one of my characters is one and I'd been under the impression Arcadia was some sort of parallel dimension rather than a hidden site on Earth. Edit: And the Coruscations, actually. Suddenly I have a scientific explanation for Aurum. You're welcome, I'm glad to hear it. I aimed to please. Felicity in PnP, was a clone from a DARPA project, copying a person with unstable DNA. The clones were given basic school knowledge , a job and left to see how they developed. She had, what was first thought to be luck but turned out to be "survival". the downside being, that she was stuck unable to do anything while it was happening and then needed a medical check afterwards to see what had happened and stuffing herself to restock. Sixty-five million years ago, would there have been room for two small interstellar governments (one aggressively expansionistic, one much quieter) within, say, a couple hundred lightyears of Earth? Or was this part of the galaxy under someone's firm control back then? Or do we even know? Just had to bookmark this thread and say thanks for some great info and inspiration. I mean I have 45+ toons and very little knowledge of Champions Lore.